As a business owner, you have a personal stake in your business’ future. Did you know that you can make better use of your time by outsourcing your book-keeping? Outsourcing your bookkeeping to trained professionals will allow you to spend more time growing your business and help you to better understand your finances. With greater understanding, you will gain more control of your finances, make better decisions and improve the overall outcome for your business. You can benefit from the experience we have gained from working with other small businesses. Paying employees accurately and on time is one of the great responsibilities of an employer. A key aspect in the payroll process is making deductions on amounts paid to your employee(s). These deductions include CPP contributions, EI premiums and income tax. Your employer portion of the CPP and EI also must be remitted to the Canada Revenue Agency (CRA). If you do not fulfill your obligations or comply with the CRA’s payroll requirements, you may be assessed and as a result, be fined a penalty, incur interest, or suffer other consequences. You could also be prosecuted if you do not comply with the deducting, remitting, and reporting requirements. Fines range from $1,000 to $25,000, or you could be fined and imprisoned for a term of up to 12 months. The lack of financial planning often results in failure for many small businesses. Forecasting is critical as it helps you to better understand your financial position, so you can better manage your budget, overhead, cash flow and anticipate change. You can create a positive financial outcome through with our expert strategy and experience. GST/HST stands for Goods and Services Tax or Harmonized Sales Tax. This tax is levied by Canada’s federal government or Canada Revenue Agency and charged by suppliers for goods or services. Do you freelance or do contract work? Businesses that collect over $30,000 in income are required to have a GST/HST number to claim and remit tax payments. Find out if you overpaid in taxes and get a refund every quarter of the year. 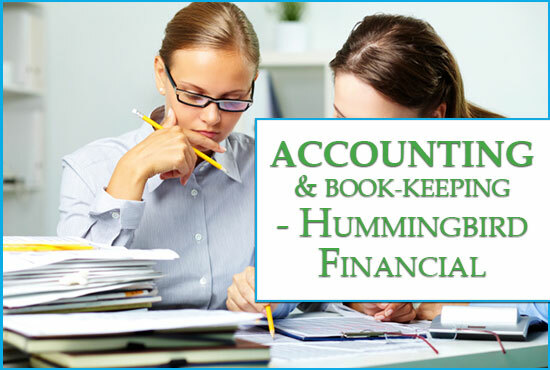 Let Hummingbird Financial take your business to the next level.